In ceremonies attended by 1,500 local Scientologists and their guests, the Church of Scientology Los Gatos was rededicated on Saturday, July 28, 2012. 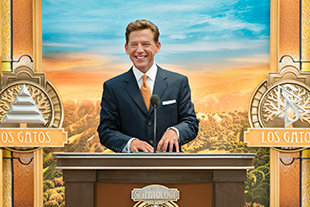 Mr. David Miscavige, Chairman of the Board Religious Technology Center and ecclesiastical leader of the Scientology religion, led the dedication ceremony with local Church officials. Scientologists and guests from across the Bay Area celebrated the ribbon cutting of the Church of Scientology Los Gatos on July 28, 2012. The Church has been newly transformed throughout to accommodate the Church’s ever-growing congregation and extend its social betterment programs to all communities from southwest San Jose to the Santa Cruz Mountains. On Saturday, July 28, 2012, fifteen hundred Scientologists and guests celebrated the grand opening of their newly transformed home on Saratoga Avenue, north of Los Gatos. The Church is now fully equipped to deliver the entire spectrum of Dianetics and Scientology services and provide for parishioners and their communities throughout the region. The Church of Scientology Los Gatos, standing at 650 Saratoga Avenue, was newly transformed to better serve its ever-growing congregation and communities from southwestern San Jose to the Santa Cruz Mountains. The expanded facilities include state-of-the-art audiovisual features and the capacity to accommodate the full range of Dianetics and Scientology services. The Church welcomes all visitors wishing to obtain an introduction to Dianetics and Scientology. Among the most distinctive features of the Church is the central mahogany staircase and skylight just off reception. The Church’s Public Information Center provides a complete introduction to every aspect of Dianetics and Scientology—including the beliefs and practices of the religion as well as a biographical presentation on the life and legacy of Founder L. Ron Hubbard. The Information Center further presents exhibits on the many humanitarian initiatives and social betterment programs the Church sponsors. Visitors are welcome to take a self-guided tour of the Center’s displays at their leisure and to return as often as they like. All Scientology congregational services and ceremonies are convened in the Chapel, including Sunday Services open to all. The café welcomes those touring the Church or attending our many scheduled events. It is further provided for parishioners during breaks in their Scientology services. The bookstore makes available Founder L. Ron Hubbard’s scripture on Dianetics and Scientology. In all, Mr. Hubbard’s legacy comprises tens of millions of published words in dozens of books and thousands of recorded lectures. A Materials Guide Chart provides an informational overview of every book and lecture series and the subjects contained within each. These materials are available in 17 languages. One of several Seminar Rooms providing for evening and weekend seminars on the fundamentals of Dianetics and Scientology. The Church houses multiple classrooms for introductory courses on Dianetics and Scientology principles and their application in life. The Hubbard Guidance Center is where Scientologists participate in auditing (spiritual counseling). Beyond this waiting area are rows of auditing rooms to meet the needs of the Church’s growing congregation. L. Ron Hubbard developed the Purification Program to free individuals from the mental and spiritual damage caused by drugs and toxins, through a regimen of exercise, sauna and nutrition—all of which are provided for in the Purification Center. Scientology auditing (spiritual counseling) is delivered in dozens of auditing rooms, each of which provides a quiet, distraction-free environment necessary to achieve spiritual enlightenment. The Academy is where Scientologists train to become auditors (spiritual counselors), capable of applying the technology of auditing to help others attain spiritual freedom. The Los Gatos Academy comprises multiple course rooms, each devoted to a different aspect of training. Traditional in all Churches of Scientology is the Office of L. Ron Hubbard, honoring the religion’s Founder and symbolizing that this Church is true to his writings and ideals. The Church of Scientology Los Gatos stands fully transformed on Saratoga Avenue. The Church’s new facilities accommodate the entire range of Scientology services to parishioners and provide for social betterment and humanitarian programs to all communities from southwestern San Jose to the Santa Cruz Mountains. On Saturday, July 28, fifteen hundred Scientologists from across the San Francisco Bay Area gathered to rededicate the Church of Scientology Los Gatos. The ribbon cutting marked the transformation of the Ideal Church of Scientology (Ideal Org) to better accommodate its ever-growing congregation and to extend Church social betterment and humanitarian programs to all communities along the Santa Cruz Mountains and southwestern San Jose. The Los Gatos Ideal Org now houses state-of-the-art facilities presenting fundamentals of the religion to those new to the religion. Most prominent among them is the Public Information Center—an expansive exhibit of interactive displays containing more than 500 informational video presentations in 17 languages. At the touch of a button, visitors are provided an introduction to the beliefs and practices of Dianetics and Scientology, as well as the life of Founder L. Ron Hubbard. The displays further offer an overview of the many Scientology-sponsored programs for social betterment throughout the world. The Center is open for self-guided tours daily, from morning to night. The Church’s new Chapel not only accommodates all congregational services, but is also now fully equipped to host a wide range of events for the entire community—including lectures and seminars, film showings, banquets and receptions. The Church further houses dedicated facilities for a wide range of Introductory Services, including evening and weekend Dianetics and Scientology seminars on fundamental principles and their application in life. Additional classrooms accommodate a wide array of introductory courses imparting Scientology tools to improve any facet of life. The newly transformed Church also includes an ideal Hubbard Guidance Center for Scientology spiritual counseling, known as auditing, and an expanded Church Academy with multiple study rooms for the training of Scientology counselors. The rededication of the Church of Scientology Los Gatos follows a series of new Ideal Orgs opened so far in 2012, including the Church of Scientology Buffalo, June 30; Church of Scientology Phoenix, June 23; Church of Scientology Denver, June 16; Church of Scientology Stevens Creek of San Jose, June 9; Church of Scientology Orange County, June 2; Church of Scientology Greater Cincinnati, February 25; Church of Scientology Sacramento, January 28; and Church of Scientology Hamburg, Germany, January 21. Ideal Orgs realize Scientology Founder L. Ron Hubbard’s vision for the religion. They not only provide the ideal facilities to service Scientologists on their ascent to greater states of spiritual awareness and freedom, but they are also designed to serve as a home for the entire community and a meeting ground of cooperative effort to uplift citizens of all denominations. Among the dozens of Ideal Orgs further opened in recent years are those that now stand in Los Angeles, Pasadena and Inglewood, California; Las Vegas, Nevada; Seattle, Washington; Minneapolis-St. Paul, Minnesota; New York, New York; Washington, D.C.; Tampa, Florida; Nashville, Tennessee; as well as Quebec City, Canada; Mexico City, Mexico; London, England; Melbourne, Australia; Brussels, Belgium; Madrid, Spain; Rome, Italy; Berlin, Germany; and Moscow, Russia. For a complete list of new Churches of Scientology, visit Scientology.org. Six more new Ideal Orgs are scheduled for grand opening in 2012. The Scientology religion was founded by author and philosopher L. Ron Hubbard. The first Church of Scientology was formed in Los Angeles in 1954 and the religion has expanded to more than 10,000 Churches, Missions and affiliated groups, with millions of members in 167 countries.